culfw is a GPL'd firmware for the CUL family of devices. Current Version: (as of 2017-09-07) is 1.67. See the CHANGED file for current changes. culfw is used in conjunction with the CUL/CUN/CUR and a high level software like fhem to automate some common tasks in the household like switching lamps / shutters / heating / etc. and to log events like temperature/humidity/power consumption. 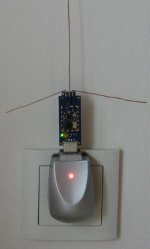 CUL is a device which is attached to the PC, making it capable to receive and send 868MHz RF signals. 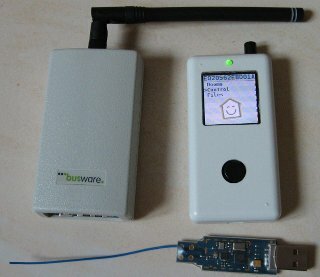 culfw is the firmware which implements some RF protocols on the CUL, and makes them useable by fhem, which runs on the PC and coordinates all the tasks. At the heart of the CUL family of devices is the Texas Instruments CC1101 RF IC and an Atmel CPU. The radio interface is tuned for 868MHz (or 433MHz). Both the CUN and the CUR have some oboard flash (2MB) for local logging. The CUN has an enc28j60 Ethernet chip, the CUR a pcf8833 (130x130 pixel, 12bit) display controller. From the program memory 4kB is used by the USB-Bootloader, and 4kB by the LUFA USB library. There are numerous FS20 devices, AFAIK. all of them are fully supported. Communication to the FHT80b and directly to the FHT8v is supported. Sending out FHT80TF data pakets to FHT80b. Devices: There are numerous HMS devices, AFAIK. all of them are fully supported. Some 868 Hoermann garage door openers. BidCos(R) in the "AskSin" mode (20kHz datarate, FM). HomeMatic(R) Wireless devices use this protocol. When configured as an RFR (RF-Router) client, then a CUL plugged into a wall socket can communicate via high-speed RF to the base, while serving all the SlowRF protocols. CUNO: OneWire and InfraRed support. Insert the device into the USB slot while pressing the micro-switch. Install the package dfu-programmer, then execute "make usbprogram". After flashing the CUL, a new USB device should appear: "03eb:204b Atmel Corp.". If not reinsert the device without pressing the micro-switch. See also this link for details (german). Do no install any drivers. Get the Windows Flash tool "FLIP" from Atmel, start it, detect the CUL and flash the file CUL.hex to it. Install the package avrdude and check the makefile for the correct port (look for AVRDUDE_PORT). Then execute "make usbprogram". Install the package avrdude and then execute "make program". The device should appear as /dev/ttyACM0 (check /var/log/messages). To test it start "screen /dev/ttyACM0", and then type V. The version string should appear. To use the device in fhem, define it as a CUL instance: "define MyCUL CUL /dev/ttyACM0 1234". See the fhem documentation for details. For the rpiaddon replace ttyACM0 with ttyAMA0. Right-click on the docs/MyUSB_USBtoSerial.inf file, and install it. Then install a virtual COM port: Locate the COM-port in the device manager shown as "USB Virtual Serial Port (COMx)". Start Hyperterminal, open a connection to COMx 9600,8,n,1. Type "V". The string "V 1.0..." should appear. Type X01 to enable the data reporting. Connect the device to a network with a DHCP server, and then telnet to the assigned IP address with "telnet ip-adress 2323"
Read the commandref.html file for more details. Rudolf Koenig (r dot koenig at koeniglich dot de). Note: I do not provide support via private mail, use the google group instead. Thanks to TOSTi for inspiration and numerous other people for help.